If you plan on doing any holiday entertaining this year, you may be thinking about adding a chocolate fountain to your menu. And if you are going to be using a chocolate fountain, you are most definitely going to need marshmallows…lots and lots of marshmallows! This holiday season, why not add a pop of color to your marshmallows with some good old fashion tie dying? With just a few simple ingredients, you can make your ordinary marshmallows something extraordinary! We were able to find all of these ingredients at our local discount store, so not only is this a festive recipe, but it is a frugal one as well. 1. 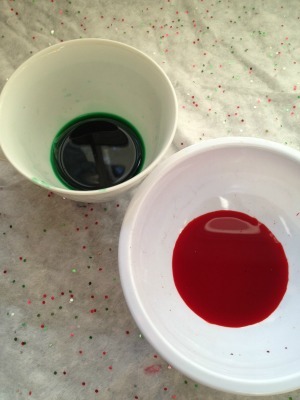 Begin by adding 2 drops of food coloring to individual bowls. 2. Add ¼ cup of cool water to the bowls and mix well so the food coloring disperses. 3. 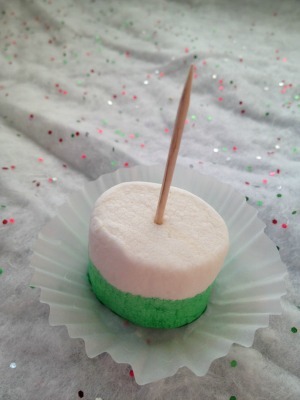 Place a toothpick into each marshmallow. This is what you will hold the marshmallow by when you dip it. 4. Now it is time to start dipping. Simply place the bottom portion of the marshmallow into the mixture and hold it for 5 seconds. You don’t need to hold it long for the color to take hold. If the color is lighter than you wish, just add another drop of coloring and mix again. 5. Set the marshmallow onto a cupcake cup so the extra liquid can be absorbed. 6. Begin a new marshmallow. You can choose to use a different color or dip the piece in a different direction. For our sample picture, we dipped some in horizontally and some in vertically. 7. 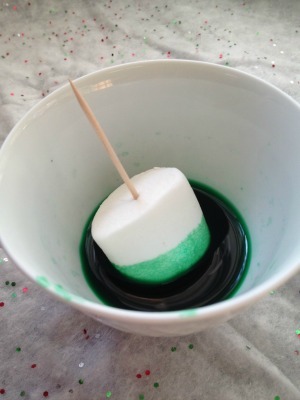 Once your marshmallow is no longer dripping extra mixture, you can dip it in a second color. Do this by moving the toothpick to the opposite end and repeating the process, this time in a new color. 8. 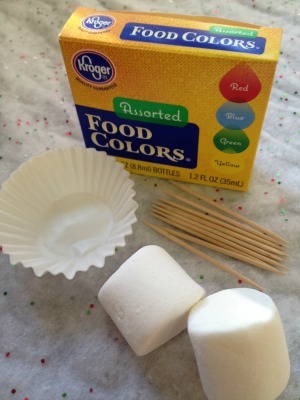 Set the marshmallow down in a new, clean cupcake cup so it can dry without mixing colors. 9. Allow a good hour for your marshmallows to dry before using them. When you are ready to use them, just place them in a bowl for display or on skewers set in a vase so guests have easy access to them. As you can see, these tie dye marshmallows make quite a colorful statement! You can do them in any color combination you wish, at any angle you wish, allowing you to get as creative as you wish! Give this simple DIY project a try and see what you can come up with. Your guests are sure to be impressed. Note: Special thanks to my friend Katie Femia from Premeditated Leftover for this awesome craft project and photos! So cool! I can see doing this for other holidays as well, including July 4th, Valentines, and our upcoming Halloween. Cute. I never would have thought to do that. It does dress them up. These are so cute. It would be a great project for the kids…if they wouldn't eat all the marshmallows! This recipe is a God-send. Have you heard of the Wordless Book? I was going to make jello squares in the colors of the wordless book.for a training class for After-school Bilble Club. 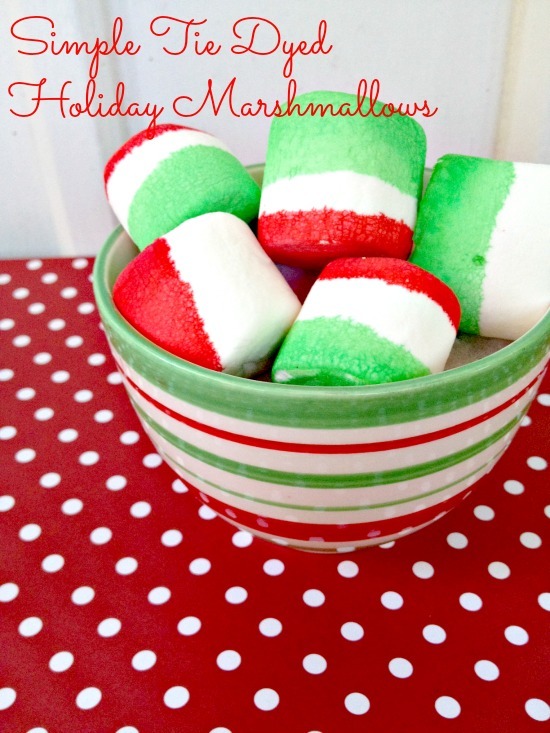 Now I think I will do Holiday Tie Dye Marshmallows and add the yellow, blue & black. Thank you! I’m so glad I could help! Send us a picture when they are finished! Those are very cute, and not as hard to make as I thought they would be. I'm always afraid to try new recipes. So, thanks for sharing somthing easy!!! So cool.Thanks for the post. I love this idea and it's so very simple! Not only could these be eaten, but they could be used in decorating. Thank you! Wow cool gonna have to try this for the holidays!!! Thank you. They look so festive. I know the kids will love them. I had not thought of a chocolate fountain but it is certainly a very good idea — although I do not have one so I will have to ask my sister if I can borrow hers. This is the greatest. Everyone in my family Loves marshmellows, I have a pack of Lg. marshmellows in the cabinet now. I am going to use this to decorate my marshmellows for Christmas. My family will Love it!!! Thanks a lot for sharing. These are really cute, pretty! And fairly easy to do! This is a cute and festive idea. So cute and easy…and can customize for different celebrations! These look so amazing. I so gotta try this with the kiddos! How cool! My kids would love to try them! Very cute idea and easy to do with children! What a great idea!! My 4yr old loves to paint so this will be a fun holiday tradition to start with her 🙂 Can't wait to try it!! These are super cool! Thank you for sharing! These are going to be fun to make with my kids. Thanks for sharing. This is a neat thing to do with marshmallows. I like the xmas colors and my kids will enjoy doing this. What a cute idea; who would have thought it would be so simple to add some festiveness (is that a word?)! 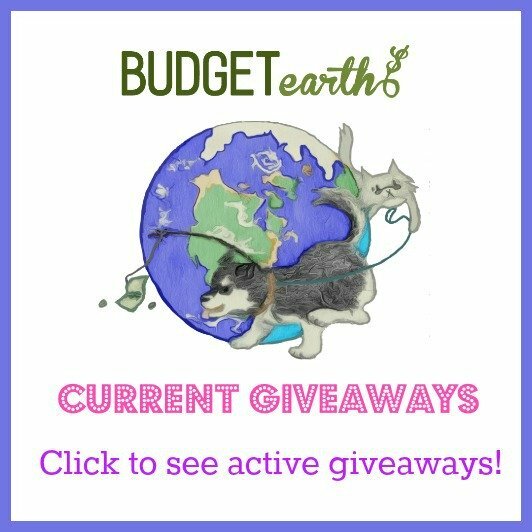 This is a fantastic Idea!!! Thank you!!!! This is such a great craft to do with the kids. Thanks so much for sharing. Very cute. You can decorate them as edible ornaments. This is a great ideal. My son loves marshmellows. This will be a great treat for us to do together. Thanks for sharing this awesome ideal. What a super cute idea! 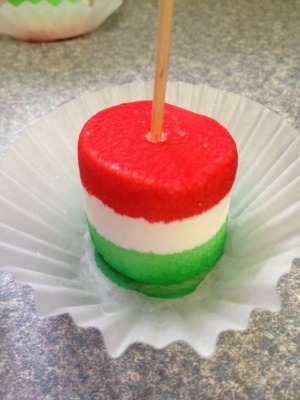 I want to make these for the kids! These are so cool! I'm going to make these with my grandchildren! It will be so much fun! Thanks for the great idea! Those are so cute, and look easy enough to make – which is good for me. I can just see them as festive table adornments this year. So cool. What a great little idea for christmas and to make with the little ones. Thanks for posting. So cute, I will definitley be doing this!!! My girls are going to have so much fun making these! Saving for later! =) Thanks for sharing!! This is a very cool idea and great for little children. What a great Idea! you've thought of everything Christmas marshmellows Having fun! What an awesome idea…………you could stack them to make a tree in just green and then use the shaped marshmallows that they put out of christmas to decorate or use the mini ones for garland. hahaha! Awesome! That looks so simple and kids will love it! very cut! i wonder if it would work with natural dyes? This is such a cute idea. It would be fun for kids parties and other holidays too! This is super cute! But I think with little kids this could give me green and red counters and kids for a week!!! This is a good idea. I'd like to see my son's reaction when he sees these marshmallows so colorful. Those look amazing! Looks like it takes a lot of patience, but well worth it! 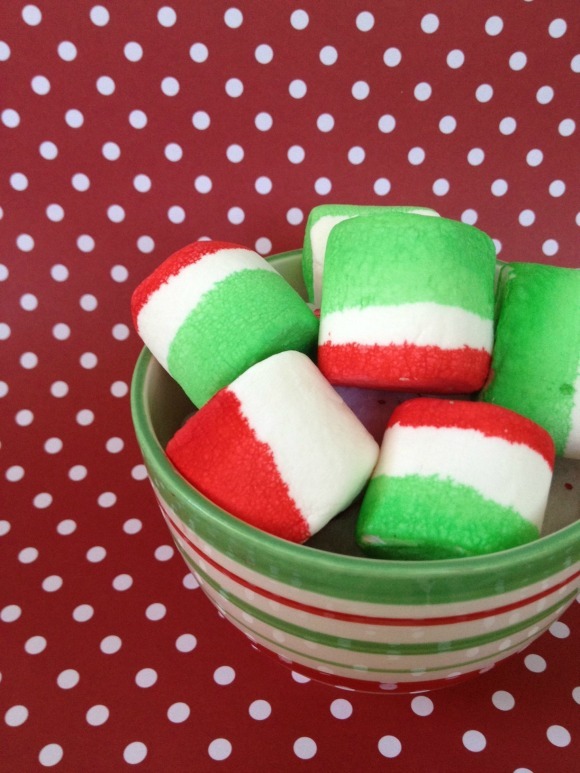 Adorable and so easy and festive!! These are really cute and very easy to do! Have to find a way to add chocolate! These are so fun! Thank you for sharing. OMG! Ive seen a lot of things but never this one! LOL This is so cool! My grand kids LOVE marshmallows! Im going to have to do this for them, TY! Always looking for grand baby pleasers! My nieces would love this! I’ll use this as one of our advent calendar crafts. My girls would love these! Keeping this in mind for the upcoming holidays.